A fool proof vanilla sponge cupcake recipe that is light and moist and not too sugary. I have decided to scale the recipe down and give a couple variations of my cupcake recipe, just in case you you might want to make less than 24! 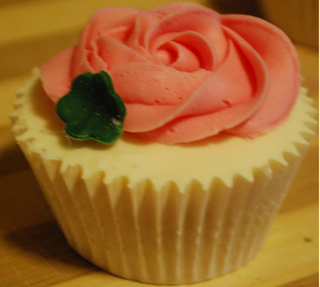 I used fondant to make little sugar flowers to close the buttercream rose at the end. Preheat the oven to 150 degrees and make sure that all ingredients are at room temperature. Whisk the margarine for exactly two minutes until fluffy. Reducing your speed, add the eggs one at a time till you have a pale mixture. Using a mental spoon, fold in the baking powder and flour making sure not to beat too much as this creates a tough sponge. Loosen the batter with some milk, no more than 3 tablespoons. Plop the mixture into cupcake cases until each is two thirds full. For the buttercream, sift the icing sugar in a bowl. In a seperate bowl whisk the butter for two minutes. Slowly as all the icing sugar to the butter. Now add the vanilla and some milk if too thick. Ice cakes once completely cooled.